The Isle of Wight County Press announced on 4thFebruary 1928, that Shepard Brothers had taken delivery of a new motor barge, The Bee, which was to replace a sailing vessel of the same name which had been carrying goods to and from the Island since 1801. 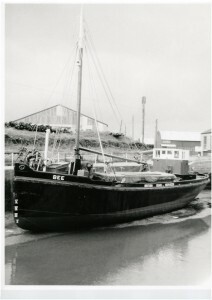 The new vessel arrived in Newport from Faversham, where she had been built at James Pollack and Sons shipyard, with a cargo of cement for ballast on 31 January 1928. The Bee’s routine role was to be dramatically interrupted in May 1940, while moored in Portsmouth. The Admiralty signalled the official start of Operation Dynamo at 1857 on Sunday 26th May 1940. Two days later, on Tuesday 28th May, the Bee was in Portsmouth Harbour and the crew were routinely unloading cargo, when a Naval Officer boarded the ship and told the captain that the Navy was taking over command of the vessel. A naval crew would take over unless the crew volunteered to take part in a dangerous mission. Like the crews of the other Island ships, they all did. By Thursday 30th May the crew found themselves being bombed and shelled off the beach of Dunkirk. 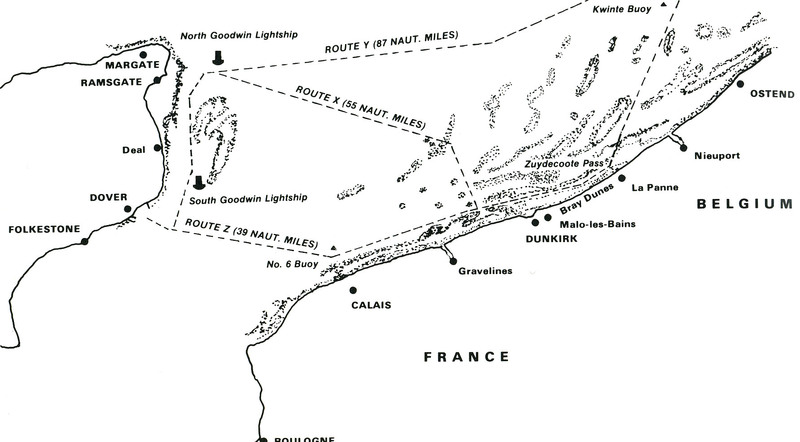 The three routes to Dunkirk planned by the admiralty. To save time Captain Trowbridge chose Route Z. 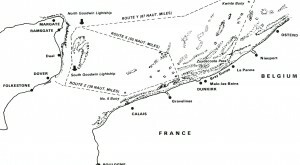 This route was close to enemy guns on the shore and the Admiralty advised that it should only be used at night. We were now nearing the beach; another near miss, no one could be lucky enough to survive this holocaust. Now a welcome sight. Nine of our fighters arrived and straight into the Huns they went; easy targets those dive bombers. Some scattered and fled, some went down. Our planes could not remain long and back came Jerry with his unceasing bombing, but still that procession of men came down to the water’s edge. There was nowhere else to go. Cars, lorries and motor cycles were being driven into the sea or destroyed on the beaches. A lone chestnut horse ran up and down the beach. More RAF planes arrived, one crashed on the beach, but with more of our planes what a different story it would have been. Bee drove at full speed on to the shore and grounded; they came towards us, some wading almost to their necks in the water, those men of the BEF, and we realised that our efforts to assist them aboard with ropes and scrambling nets were futile. Waterlogged and utterly exhausted, many wounded, it was impossible for them to make such an effort. We quickly sawed the ship’s ladder in two, placing one half on each side of the bow The success was reward enough to see these men file aboard some equipped with nothing but a covering of clothing, but all with a determina­tion to live. A pause in loading for another raid. We escaped, but just along the beach there was a terrible toll in life and little ships. Another start and with a few interruptions we filled to capacity Every spot where a man could stand was packed both down in the hold and on deck. Their weight was such that we were stuck firm on the beach and for over an hour we struggled to free ourselves until our plight was spotted by a French tug and we were pulled free. When finally underway our elation was short lived. We were ordered to transfer the troops to a larger vessel lying offshore, (375 soldiers were transferred to a tug -editors note), and not once but twice more returned to the beach for further troops. Fearing that any further grounding might be permanent we used our pinnace to pick up the soldiers, but this proved a painfully slow process amid ever increasing bombing and shelling. Where there had been ten or a dozen enemy planes dive-bombing ships earlier on, numbers now seemed more like 50, and not only was there more shelling it was also increasingly accurate. Just as we were leaving a naval motorboat came on the scene and picked up another twenty men that she later transferred to us. However going in for another pick up she capsized in the , by now, rough seas and all but one of her crew swam ashore. The other member tried to swim out to us but he made little progress against the tide so we threw him a life buoy on a line and eventually pulled him on board. Just as we were leaving for a second time we saw a small boat leave the shore so we waited for her to and brought five French soldiers on board. During the rescue one of the Bee’s propellers was fouled by a piece of wire and so she could only use one engine. 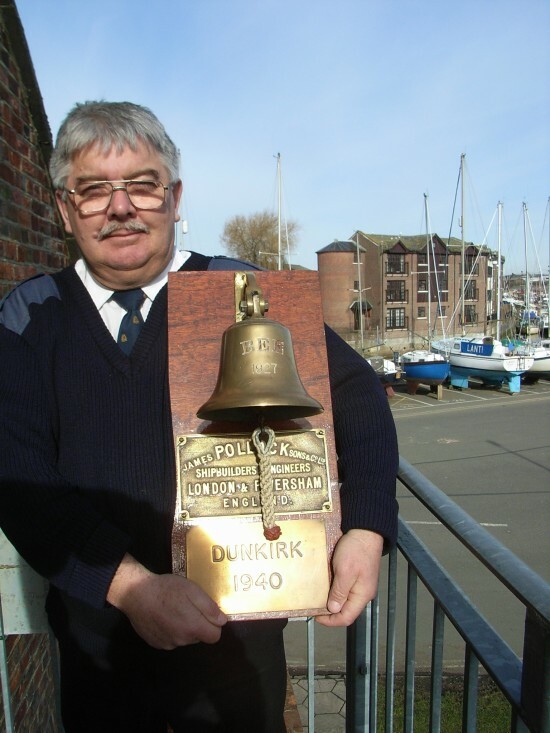 When she got to Ramsgate the skipper was ordered to return to Newport for repairs. 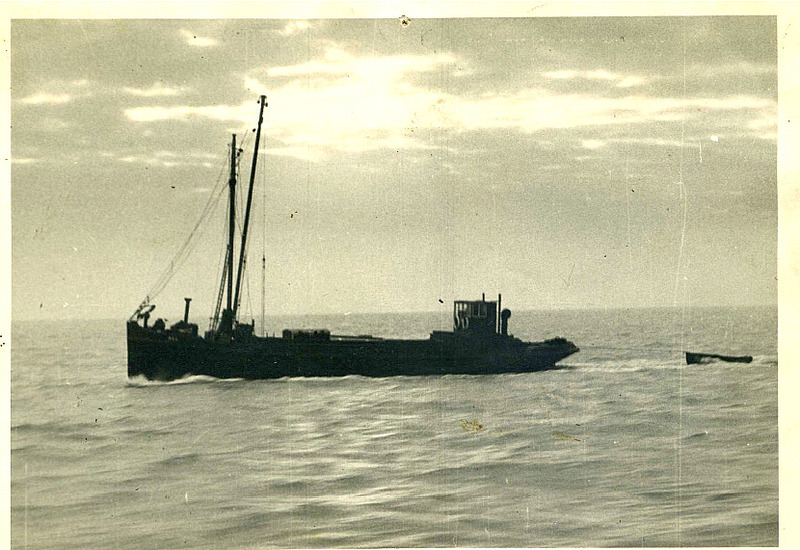 On her way back she passed the Hound, the MFH and the Murius on their way to Dunkirk. Sources: Fred Reynard, Wayne Pritchett (Newport Harbour Master), Brian Greening and “The Ships That Saved An Army” by Russell Plummer. Her draft was just two metres when loaded. This was a real advantage for her work on Operation Dynamo as she was able to go very close to the shore to pick up troops. Footnote – While working on one of the boats in December 1968 a large wave hit a barge which was being towed from Portsmouth. The tow rope snapped and wrapped round Mr Hocking. He died a week later from injuries he received. My father saw your letter in the County Press and has asked me to write to you. Dad worked as a marine fitter for Pickfords for 43 years, (the same company as your great-uncle), and was working there during the Dunkirk evacuation. He has told me that the M.V.Bee when she was at Dunkirk picked up a hawser from a sunken ship wrapping it around her port propeller. She returned to Newport and was pulled up onto the slipway at Odessa Yard which is in Little London, (Newport Quay). My father had the task of sawing the hawser off and repairing the engine. Dad also said that the crews on returning didn’t talk much about what happened but went straight home to families and to sleep. I hope this gives you more information and I have also enclosed a leaflet about the company your great-uncle worked for.